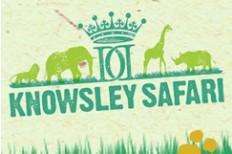 A website I use quite regularly for deals in Leeds (similar to groupon etc) is selling knowsley safari park family tickets which are valid for 2 adults and 2 children (aged 3-15) for 21 pound, this is half the price that you would pay on the door and online in advance. A fantastic, cheap summer day out which can be done even when we have this tubbish rainy weather. Would also personally reccomend the sea lion show if you do go! Hope this helps any families stuck for ideas on what to do this summer. If you're looking for a thrilling day out, look no further than Knowsley Safari Park. Visit the friendliest and most exciting safari park in the UK whilst constantly surrounded by stunning safari sights. Adults and children of all ages are welcome here so make sure you bring your little monkeys with you! A five mile safari drive and vast walk around area are home to over 700 exotic animals, from lions and tigers, to elephants, meerkats and of course those cheeky baboons! You won't just get an amazing experience, you'll get a close up look at the animals to really boost your day. Visit their brand new Birds of Prey Experience. These amazing birds will soar and swoop just inches above your head and, if you venture into the birds of prey centre, you may even see a baby bird hatch! Another new addition to Knowsley is the Bat Forest, home to the Egyptian fruit bats. Their cavernous palace is full of rocks and waterfalls, the perfect location to watch these dexterous animals go about their daily business. At Knowsley Safari Park they don't expect you to spend the whole day in your car, in fact you should defiantly make the most out of your day and explore their walk around area. They host tons of events and attractions to suit all, you'll certainly be spoilt for choice. From educational Keeper Talks and amazing performances from, Biffo and the boys at the Sea Lion Show to a fantastic Fair Ground and the exhilarating challenge of the high ropes, your experience there will be one you'll remember for a long time. Bring your pride leader and your cubs to one of the best attractions the North of England has to offer! PLEASE NOTE THAT THIS TICKET WILL BE SENT VIA POST TO THE ADDRESS THE ACCOUNT IS REGISTERED WITH. ANY CHANGES TO YOUR ACCOUNT DETAILS SHOULD BE MADE BEFORE THE TICKET IS PURCHASED! thanks again OP been looking for days out with the family and this and the blackpool sealife will be great. YOUR TICKET WILL BE POSTED TO THE ADDRESS YOUR ACCOUNT IS REGISTERED WITH! Love days out vouchers cannot be used in conjunction with any other offer. do tickets come through the post or what? Thanks for the deal, Great. hot deal. I bought a years pass many moons ago with my eldest daughter. great day out. thanks OP! This is cheaper then 2 adult tickets which is all I need, do you think they would mind if I turned up with no kids?? This is cheaper then 2 adult tickets which is all I need, do you think … This is cheaper then 2 adult tickets which is all I need, do you think they would mind if I turned up with no kids?? If not just steal someone elses. Morally and legally questionable, but they get in for free so sod it! A great place as well, heat. Try rock fm or radio city deals.